Good Jobs First rounds up all the opposition to Amazon's hidden play with public dollars. Washington D.C.-based nonprofit Good Jobs First released a report earlier this month on Amazon’s strategy to wrangle incentives out of municipalities in return for locating its second headquarters (HQ2) on their lawn. The nonprofit joins a choir of organizations that have called the process unfair, criticizing the opacity surrounding the negotiations of the use of taxpayer funds and the high probability of a poor cost-benefit outcome for the winning city. There aren’t many cities in the running that have released what they are willing to fork over. A total of 238 cities applied in the first round. Their deals are not blocked by any non-disclosure agreements. Yet a complete, un-redacted list of what they offered is not available. Those submissions would inform us of the ante to this poker game. The remaining 20 cities who survived to the second round were required by Amazon to sign non-disclosure agreements banning public release of their offers. The NDA even prohibited disclosure of Amazon’s visits to inspect the livestock. Some visits are known, but only after the fact. Often it’s more telling who’s against than who’s for something. More than 125 community groups signed a letter to Amazon CEO Jeff Bezos demanding Amazon open negotiations on what the company will bring to their chosen community. Their big three buckets were jobs, infrastructure, and accountability/transparency in their negotiations. The letter, sent in October 2017, contained groups from 14 of the 20 finalist communities. As expected, liberal California had the most signees. But, at 15 groups, conservative Pennsylvania came in second. Texas? Only the Texas Organizing Project (TOP) signed. TOP “promotes social and income equality for low to moderate income Texans.” Why would TOP be protesting Amazon’s promised arrival of 40,000 to 50,000 six-figure salaried jobs? TOP’s goal, like many community groups, is to shine a light on the poor quality of most Amazon jobs. While HQ2 is promising to bring the high-paying tech gigs, thousands of warehouse workers toil away for wages so low that some qualify for public assistance. TOP also wants Amazon to provide improvements for their chosen city versus Amazon receiving incentives and giving nothing back. In January, New York University professor Scott Galloway described the process as Amazon’s way of transferring value (by way of subsidies) from taxpayer pockets to Amazon’s pockets—the business version of Hunger Games. These corporate welfare packages are often approved behind closed doors. The recent Good Jobs First report cites Amazon’s home state of Washington where a Boeing deal went sour. In 2013, an $8.7 billion tax subsidy deal was approved in just three days. While touted at the time as a jobs booster, by September 2017, Boeing had actually laid off 16,684 staffers. Boeing was able to keep the incentives because there was no claw-back clause for non-performance. Amid those thousands of layoffs, they were still on the hook for $8.7 billion. The new report lists other state deals with Tesla, Apple, and Dell as additional examples of overzealous governments failing to incentivize performance. Wisconsin’s recent gift of $3 billion in incentives to Foxconn may turn out to be another. Another group calling itself Generation Prosperity comprised of “conservative millennials” abhor the giveaways and secrecy. Generation Prosperity is a sister organization to the Koch-funded Americans for Prosperity that routinely oppose government subsidies. However, a government TIF subsidy used in a 2014 Oklahoma plant expansion saved Koch Industries $148.7 million in property tax increases. At the other end of the spectrum we have a group calling itself “No Gay? 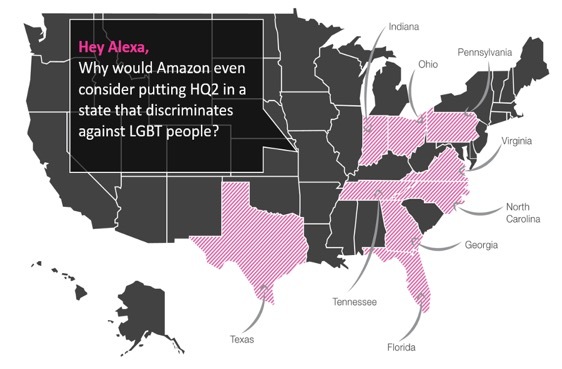 No Way!” that is trying to pressure Amazon into upholding its own anti-discrimination stance. Amazon has written several letters in recent years decrying Texas’ anti-gay positions. The protest group points out that 12 of the final 20 cities are located in nine states lacking comprehensive protections for the LGBTQ community. An image by the group No Gay! No Way!, which identifies states that it believes have discriminatory laws against LGBTQ people. The other side of the coin posits that were Amazon to come to Texas, its outsize influence would ultimately dampen Texas’ brand of retaliatory governance. Personally, I believe Texas’ backwards social views are better at generating out-of-step legislation than attracting forward-thinking technology companies. Opposition boils down to a financial message for a winning city of “beware of what you wish for” and a potential sacrifice of Amazon’s corporate culture (for money). Remember, the public knows almost nothing about the second round of negotiations and any increased incentives beyond their initial bids (under NDA). So far, Boston and Toronto released their entire submission that outlined existing programs Amazon might qualify for—but didn’t include much in the way of dollar amounts. For example, the Boston bid included a scant $92 million based on existing programs, but doesn’t address money available, almost certainly in the billions, via other avenues. At what may be the high-end, we know New Jersey and Maryland’s offers because they had to seek special legislation in order to enact the incentives. New Jersey offered the much-publicized $7 billion in incentives and tax breaks while Maryland clocked in at $8.5 billion. A leak indicates Chicago’s round one proposal was worth at least $2.3 billion. At the other end we have Texas, California, Florida, New York, Northern Virginia, Pennsylvania, Georgia, and North Carolina—they have offered the public no details on their round one offers. In Texas, real estate non-disclosure is still the norm. Here in North Texas, as our Peter Simek discovered, state law protects municipalities from responding to open records requests for emails and other messages from elected officials who may be discussing public tax incentives. And because Dallas’ bid was handled through the private Dallas Regional Chamber, neither entity has to release any details about their negotiations. So it should come as no surprise that neither Dallas nor Austin has said or leaked anything of significance about their offerings. So far, we’ve been offered a boilerplate quote: “North Texas will be competitive with packaged that run into the billions of dollars being offered in other states.” Austin’s officials say the city has offered no set amount of subsidies. Both Austin and Dallas would be able to tap the state’s slush fund for closing deals, called the Chapter 380 grant program. Texas has another problem. The lack of state income taxes means that those 40,000 to 50,000 new workers won’t be offsetting any incentives beyond property and sales taxes. The recent Good Jobs First report begins with a May 2016 quote from Amazon CEO Bezos, the year before this circus began, and three years after his purchase of The Washington Post. Making sure that there is light—until it threatens to shine on how taxpayers are subsidizing his multi-billion dollar corporation.